Implementation is the most important (and difficult) part of the planning process: achieving the Goals and Objectives set out in the Strategic Plan while remaining alert and flexible to new opportunities as they unfold. 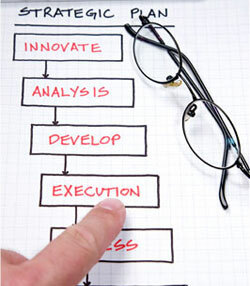 To be effective, a business must integrate the results of the strategic planning process into their business. Keycare uses Action Plans in the implementation process, which are built in easy to use tables that can be used for follow up and accountability. The central purpose of this process is create action..somebody assigned to do something...well thought out, sound, and appropriate, and helps to assure that the limited resources of the enterprise (time and capital) are sharply focused in support of the direction identified earlier in the strategic planning process.